Welcome to Jupiter Engineering ConcernManufacturer & Supplier of Material Handling EquipmentsThe company was established in 1985, at Howrah. Our Dedicated & skilledprofessionals help us to cater Indian Subcontinent. Power Mack Project Ltd. and Yash & Co. are some of our reputed clients and we arebacked by customized solutions & excellent logistics support. We offer a wide array of Pulley Blocks, Wire Rope Pulley Ropes & Sheaves. 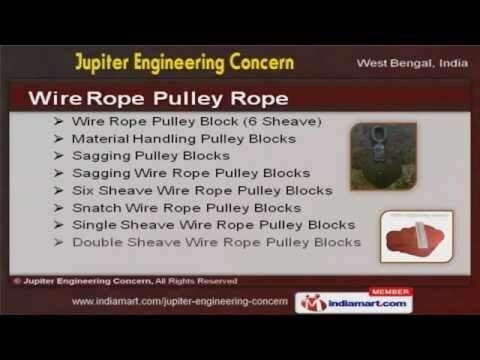 Our Wire Rope Pulley Rope are best in the industry amongst others. Wire Rope Sheave offered by us are some of our best selling products. Our Material Handling Accessories are widely acclaimed in the market. We also provide Pulley Blocks that are acknowledged for their functionality. Along with that we offer Ratchet Lever Hoist, Chain & Equalizer Pulley Blocks that are aclass apart.